The BQ2084-V140 SBS-compliant gas gauge IC for battery pack or in-system installation maintains an accurate record of available charge in Li-ion or Li-polymer batteries. The BQ2084-V140 monitors capacity and other critical parameters of the battery pack and reports the information to the system host controller over a serial Communication bus. It is designed to work with the BQ29312 AFE protection IC to maximize functionality and safety and minimize component count and cost in smart battery circuits. Using information from the BQ2084-V140 the host controller CAN manage remaining battery power to extend the system run time as much as possible. The BQ2084-V140 uses an integrating converter with continuous sampling for the measurement of battery charge and discharge currents. Optimized for coulomb counting in portable applications, the self-calibrating integrating converter has a resolution better than 0.65-nVh and an offset measurement error of less than 1-?V (typical). For voltage and temperature reporting, the BQ2084-V140 uses a 16-bit A-to-D converter. With the BQ29312 the onboard ADC also monitors the pack and individual cell voltages in a battery pack and allows the BQ2084-V140 to generate the control signals necessary to implement the cell balancing and the required safety protection for Li-ion and Li-polymer battery chemistries. The BQ2084-V140 supports the Smart Battery Data (SBData) commands and charge-control functions. It communicates data using the System Management Bus (SMBus) 2-wire protocol. The data available include the battery's remaining capacity, temperature, voltage, current, and remaining run-time predictions. The BQ2084-V140 contains 1k bytes of internal data Flash memory, which store configuration information. The information includes nominal capacity and voltage, self-discharge rate, rate compensation factors, and other programmable cell-modeling factors used to accurately adjust remaining capacity for use-conditions based on time, rate, and temperature. The BQ2084-V140 also automatically calibrates or learns the true battery capacity in the course of a discharge cycle from programmable near full to near empty levels. The BQ29312 Analog front-end (AFE) protection IC is used to maximize functionality and safety and minimize component count and cost in smart battery circuits. The BQ29312 AFE protection IC provides power to the BQ2084-V140 from a 2-, 3-, or 4-series Li-ion cell stack, eliminating the need for an external Regulator circuit. 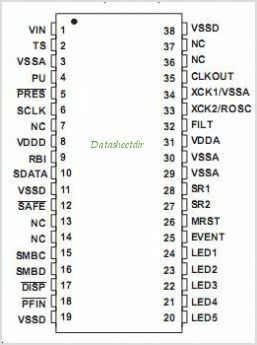 This is one package pinout of BQ2084-V140,If you need more pinouts please download BQ2084-V140's pdf datasheet. BQ2084-V140 circuits will be updated soon..., now you can download the pdf datasheet to check the circuits!